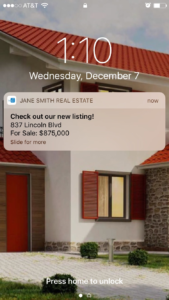 Our custom push notification feature, enables Real Estate agents to create a custom message using our web portal, to send a push notification to everyone who has downloaded your app. 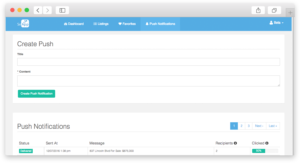 After sending the notification Agents can then access the SnApp reporting page, to see which of their users are running searches and/or saving properties. Real estate agents can also see stats for how many recipients and percentage of users that clicked on each push notification. This entry was posted in features, Mobile Apps for Real Estate Agents, SnApp Development and tagged features, mobile apps for real estate agents, snapp development. Bookmark the permalink.